The 'Beyond the Wall' episode featured a lot of clues and interesting details! Here are the best ones. During the "Beyond the Wall" episode, Jon managed to slay a White Walker with Longclaw. When that happened, all the wights in the nearby area except one were destroyed, leading Jon and the others to believe that if you kill the White Walker who created a wight, the undead creature is also killed. Sansa gave us a useful piece of information about Jon: the King in the North hasn't sent a raven to her in weeks. Finally, we have an indication of how long Jon's journey is taking! The Arrowhead mountain Jon's team approaches in episode 6 is the same one The Hound saw in the flames in episode 1. 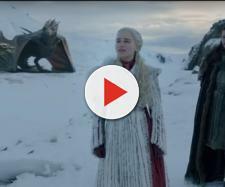 The same mountain appeared in the background of the flashback scene in which Bran "sees" the creation of the Night's King by the Children of the Forest. As you can see from the pictures featured in a previous article, the deep north was a verdant land thousands of years ago. In his conversation with Jon Snow, Beric Dondarrion remembers how Eddard Stark had sent him off to execute Gregor Clegane. As you may recall, Beric's expedition didn't end well: the Mountain killed him with a lance, and that was the first time Thoros of Myr revived him. CGI costs a lot. Check out this hilarious scene of a man swinging his spear at nothing in the clip below (0:54) He's the one behind Beric. The daggers Jorah used to fight the wights were made of Dragonglass, as well as Sandor Clegane's pickaxe. Viserion is not going to be a simple wight. The Night's King resurrected him by physically touching him just like he did with Craster's child in season 4. The other option is that the face belongs to an unknown man Arya killed off-screen after she left Braavos. There's been a lot of criticism from fans regarding the weird giant chains scene. As reported by Uproxx, a barge that was used to ferry people across the water when it's not frozen can be seen in the closing seconds of episode 6. It's still unrealistic, but at least the writers gave us a hint about where the giant chains came from. The Internet went crazy over this detail: Longclaw "opens its eyes" when Jon Snow emerges from the frozen lake. Whether this was caused by a droplet of water or a reflection is still unclear and up for debate.